Val Thorens is the main resort in Les Trois Vallées, The Three Valleys, where you also find the villages Courchevel, La Tania, Méribel, Saint Martin de Belleville and Les Menuires. The skiing area is enormous and there is little risk of not getting enough snow. It is also amazingly beautiful! Val Thorens is the highest place in the area and as a matter of fact also the highest situated place for skiing in the whole of Europe. 99 per cent of Val Thorens is above 2,000 meters. This area is actually the largest skiing area in the world. Need we say more? Val Thorens is beautifully situated among mountains covered by snow and several glaciers. It has been a skiing resort since 1946 and has been carefully planned and developed over the years. 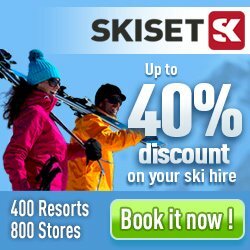 Should you lose interest in the about seventy pistes in Val Thorens itself, you can easily transfer to other places within The Three Valleys. There are more than 300 pistes and 200 ski-lifts spread out over an aera of 600 square kilometers. The skiing season is long and lasts until May. In the beginning Val Thorens was an eldorado for good skiers, but nowadays it offers something to everybody. Whereever you are there is a slope close by. And at most hotels and apartments you can put on your skis right outside the door. To increase that special holiday feeling Val Thorens is a car-free zone so you will have to leave your car at a parking lot. You will be breathing clean and clear air! If you don't feel like skiing one day there are lots of thrilling and fun activities. Something that is unique for Val Thorens is the driving school. From November to April you can try out a racing car or a four-wheeler on the racing course. Skid wildly on an the ice covered surface, test, practise and find out what your limits are. Le Toboggan, a bobsleigh track at 700 meters is just as fascinating. Everybody above the age of seven can experience the thrill of tearing down a really unique bobsleigh hill. And for extra thrill you can do it by night. For those who wish to relax in a more classical manner there are plenty of spa alternatives: classic massage, face treatment or turkish bath or whatever your heart desires. For families with children Val Thorens is great. Beside the ordinary skiing schools, toddlers as young as one and a half years old have their own skiing school. A lot of children will probably look forward to the end of a skiing day, when they can visit the sports centre. This is where you find everything for everybody in the family, like a climbing wall, a sea of balls to play in and a track for inline skating. The simplest way of getting there is to fly to Geneva (as is the case with most other French ski resorts). From the airport the distance is 160 km and the trip takes about three and half hours by bus. Chambéry (110 km) or Lyon (190 km) are also possible alternatives. From these airports there is also a bus service to Val Thorens. Renting a car at the airport is also a good alternative, but after you have unloaded your car remember you will have to park it for the rest of the week. Clean and clear air! And that special holiday feeling. Would you like to combine your skiing trip with a visit to a big city? There is a rapid train (TGV) from Paris to Moûtiers in four hours, which is just 40 km from Val Thorens. Continue by bus or taxi. Val Thorens is part of the ski area Les Trois Vallees together with 6 other ski resorts. Here you will find in total 1043 hotel, apartments and chalets/houses in Val Thorens.